GaryDelagnes was loud and angry and decrying his hometown as a feckless and stupid place with no denizen as feckless nor stupid as its chief of police. In other words, it was a Wednesday. To be fair, Delagnes was a shade more agitated than usual. After all, it’s not every day that the chief of police — a dreaded outsider from the dreaded realm of Los Angeles — publicly and intentionally spills his beer on the POA’s shoes. But, whether pushed or not, Chief Bill Scott did this. Yesterday, San Francisco’s nascent chief subbed out his innocuous, proforma letter to the Department of Elections taking no position at all on the POA-backed ballot measure to put Tasers in the hands of San Francisco cops — on the police union’s chosen terms. Scott replaced it with one decrying such a move as a travesty. Ithas been a decade-long quest for the POA to enable the doling out of Tasers to its members. In November of last year, Police Commissioner Bob Hirsch broke a 3-3 deadlock and gave the POA what it has long desired . SFPD officers will be equipped with Tasers — but only following the formation of use and accountability procedures. Several of the stakeholders involved in these ongoing negotiations said they expected the terms to be introduced as soon as this month. Well, too late. In February the police union turned in a stack of signatures for its ballot measure, which would not only arm the cops with Tasers on an accelerated timeline but largely divorce the Police Commission and even the chief himself from altering Taser use policies or holding accountable officers who deviate from them. At the time, Delagnes told the Chronicle that this was all a play for leverage: If the Police Commission established a Taser policy to the POA’s liking, “we’ll pull the measure,” he pledged. Delagnes, then, was clearly playing it fast and loose. In other words, it was a Wednesday. He was as honest as honest can be, however, when he talked up how well the Taser measure polls. A recent Chamber of Commerce tally found 76 percent of voters want Tasers in our cops’ hands. Presented as an up-or-down vote on Tasers, this measure wins in a contest resembling the Warriors vs. the Bulls. Of course, this city’s powers-that-be have already greenlit Tasers — and this is no mere up-or-down vote. As the (pro-Taser) chief of police has gone out of his way to note, this measure does a lot more than that. There is, perhaps, just one thing that could derail the police union’s quest to have the voters shoehorn its chosen Taser policy into San Francisco law. And that’s the active opposition of the (pro-Taser) chief. Thesorts of folks who oppose Tasers from the get-go — police reformers, civil libertarians, residents of communities of color most likely to be Tased — are not thrilled with the police union’s measure. No surprise there. As we have written before, Tasers are costly, dangerous and failure-prone. But Bob Hirsch is not some anti-Taser wingnut. As noted above, he’s the Mayor Ed Lee appointee to the Police Commission who provided the deciding pro-Taser vote, and has been a driving force in determining when and how they can be used. And he is livid about the police union’s measure. What’s more, Hirsch continues, the police union’s measure would set in stone policies that could then only be overturned by another voter measure or a four-fifths vote of the Board of Supervisors. And that’s a potentially deadly situation. A UCSF study found a massive spike in deaths in municipalities that deploy stun guns. Those deaths tapered back once stun gun policies were modified — but, as Hirsch notes, this measure retards the city’s ability to modify such policies. And, if you parse the policies this measure would give Hirsch et al. no flexibility to modify, there is cause for concern. This means someone shouting “I’m gonna kill you!” — even an intoxicated or mentally incapacitated person who is in no position to actually do so — could be Tased. As could someone stating “I’m gonna get you,” or “I am threatening you now!” or so many other things. The de-escalation practices that have become the mantra of police reformers within the department and without are not mentioned in the POA measure. “What the POA is saying,” notes John Crew, a former ACLU attorney studying police practices, “is that they want to use Tasers on the front-end.” This measure would appear to allow that. Forall the above reasons, Bill Scott decided to wade into this morass. But there are more reasons still, and that’s because Delagnes’ criticisms of the new chief are echoed even by officers not demonstrating the union boss’ extreme vitriol. Scott’s command staff is virtually the same as the one he inherited from Greg Suhr, the ultimate insider and POA’s fair-haired boy. He has not shaken up the department. Crime, you’ll no doubt notice, continues to be problematic. But, arguably even more than fighting crime — the ostensible duty of every law-enforcement officer on God’s green earth — this chief’s raison d’être is to institute the DOJ reforms handed down to this troubled department. The POA measure forced Scott to take a stand, lest he lose all credibility as a reformer. Nobody committed to “collaborative reform” could idly stand by and allow a change-averse police union to not only sidestep the collaborative process but to additionally undermine both the civilian police commission and the chief’s own authority. Bill Scott has tossed this new hat back at the POA. He has crossed his own personal Rubicon. The die is cast. 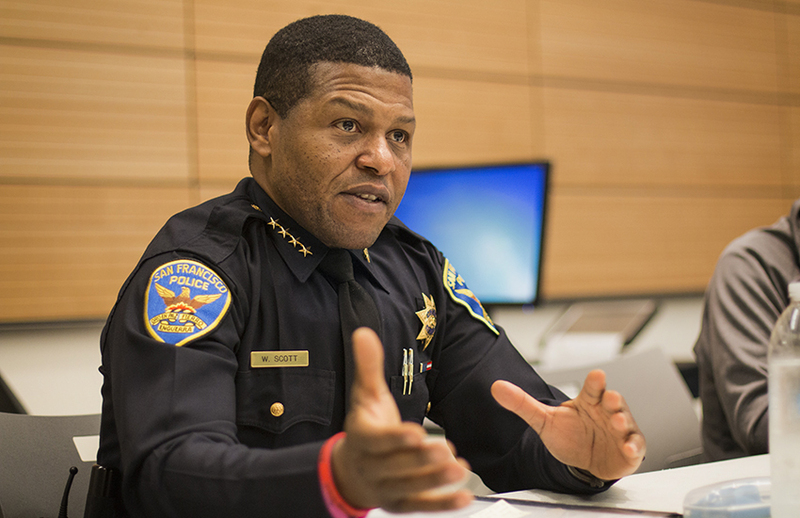 When Bill Scott was appointed San Francisco’s Chief of Police it appeared that nobody warned him about the political snake pit he was entering into in this city. The POA meets with the Chief monthly and we have tried to develop a rapport with him but at times it’s been one step forward and two steps back. Yesterday, Chief Scott took a disappointing and disastrous leap backwards. By attacking the Tasers ballot measure, [click here to read] he, as the leader of 2200 members of the SFPD, is hindering our officers from obtaining a less lethal option that will reduce injuries to the public and to our officers. This letter to the Department of Elections is counterproductive to recommendations made by the DOJ COPS review regarding implementing Tasers in San Francisco. It also could cause harm to the rank and file by preventing them from obtaining a necessary tool that almost every major law enforcement agency has available to them. Unfortunately, the Chief allowed himself to be played like a cheap fiddle by some on the Police Commission who have their own agenda. He should get rid of whoever is advising him – otherwise, he is going to drive an irreparable wedge between himself and the membership. Fortunately, there is a reasonable voice in the room. Mayor Mark Farrell came out with a strongly worded statement in favor of Tasers [click here to read]. He called out the obstructionists on the Police Commission for who they are: short sighted appointees who prefer to play politics than to do their job and keep officers and the public safe. So we want fewer gun deaths but activists don’t want tasers? Yes, I understand that tasers sometimes kill people and that’s horrible. But what do you want the police to do? Talk it out with the manic holding a knife? Actually I am a little taken back by what the POA is trying to prove…the “talk” of CED has been ongoing,more than 5 years. Why is there such a rush to have another tool,”less lethal”, and not the focus on de-escalation tactics to go along with the tools already issue. While at the same time developing real lasting policy that speaks to all of the concerns of ALL citizens. This can not be a one-sided policy that affects the entire city!! That is what has torn our city apart much like others…not recognizing the similarities always focused on differences. We all want to be safe and make it home in one piece…Officers and Citizens alike, even the criminal doesn’t want to die!